There are many things that I love about this picture, which was tweeted without explanation by Rajon Rondo last night. 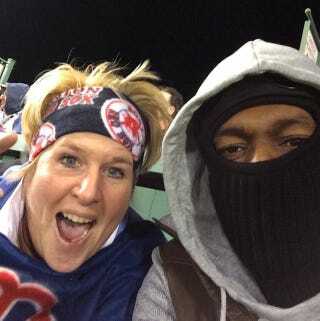 I love that lady's face, the fact that Rondo is obviously very cold and also possibly in disguise, and the fact that the photo was snapped and tweeted by Rondo rather than the lady. That last point opens up the possibility that this woman is not just a fan who spotted Rondo and asked for a picture, but is in fact Rondo's friend. Let's all agree to pretend that's the case.